We aimed to evaluate the changes in plasma membrane Ca2+-ATPase (PMCA) and sarcoendoplasmic reticulum CA2+-ATPase (SERCA-2) according to the antepartal magnesium sulfate (MgSO4) administration in the placentas from pregnancies with pre-eclampsia (PE) or fetal growth restriction (FGR). Pregnant women were classified as follows: (group 1) pregnancies without PE or FGR (n=16), (group 2) pregnancies with PE or FGR but without MgSO4 administration (n=14), and (group 3) pregnancies with PE or FGR and with MgSO4 administration (n=28). We observed the localization of PMCA and SERCA-2 in placentas and compared its expression among 3 groups. And we observed its expression in BeWo cells following treatment with MgSO4 and CoCl2. PMCA staining was more observed in the basal membrane, whereas SERCA-2 staining was observed predominantly under the microvillous membrane. SERCA-2 expression was significantly increased in group 3 compared with that in group 1. Considering the gestational age at delivery, PMCA expression was increased in group 2 and group 3 compared with that in group 1 after 36 weeks of gestation. SERCA-2 was increased in group 3, but not in group 2 compared with that in group 1 after 36 weeks of gestation. In BeWo cells, MgSO4 treatment increased PMCA and SERCA-2 expression. PMCA expression was influenced by gestational age at delivery, and SERCA-2 expression was increased in the presence of PE and antepartal MgSO4 administration. This indicates that antepartal MgSO4 administration has a greater influence on SERCA-2 than PMCA. Plasma membrane Ca2+-ATPase (PMCA) was expressed in basal membrane or microvillous membrane. There have been conflict results. Alterations in PMCA expression or activity were observed in placentas from pregnancies complicated with pre-eclampsia (PE). Only 1 report showed sarcoendoplasmic reticulum Ca2+-ATPase (SERCA) expression was increased in placentas from pregnancies complicated with PE. PMCA staining was more observed in the basal membrane, whereas SERCA-2 staining was observed predominantly under the microvillous membrane. PMCA expression was increased in pregnancies with PE or fetal growth restriction (FGR) regardless of antepartal MgSO4 administration after 36 weeks of gestation, while SERCA-2 expression was different according to antepartal MgSO4 treatment, especially at later gestation. MgSO4 treatment increased the expression of PMCA and SERCA-2 in BeWo cells, but it decreased SERCA-2 expression under CoCl2 treatment in vitro. MgSO4 treatment could be associated with PMCA or SERCA-2 expression. Further studies are need to reveal the effect of antepartal MgSO4 treatment in placentas complicated with PE or FGR. We could not identify the exact mechanism of the changes in PMCA and SERCA-2 expression. Further studies regarding calcium channels in human placentas are warranted to elucidate the pathophysiology of placental diseases such as PE or FGR. Among several calcium transport mechanisms, PMCA is responsible for the final step of calcium transfer between the mother and the fetus and is known to finely regulate the level of cytosolic-free calcium.7 In the past few decades, PMCA expression and its role in the placenta have been extensively evaluated, and it is known to be involved in the pathophysiology of PE.7–10 Unlike PMCA, SERCA-2 has been mainly studied in musculoskeletal, cardiovascular, and neurologic systems, rather than in the pathophysiology of PE.11–13 The ER consists of a series of membranous sacs with an intraluminal space of 20–30 nm located in the perinuclear region of a cell, being continuous with the outer membrane of the nucleus.14 Its functions are known to be the post-translational modification of proteins and regulation of cell metabolism, proliferation, and death.14 The other important function of ER is storage of intracellular calcium, and SERCA is involved in this function. We hypothesized that placental PMCA and SERCA-2 expression in pregnancies with PE or FGR could be influenced by antepartal MgSO4 administration. The objectives of this study were to observe and compare PMCA and SERCA-2 expression in the placentas from pregnancies with PE or FGR according to antepartal MgSO4 administration. We also studied changes in PMCA and SERCA-2 expression in BeWo cells following treatment with MgSO4 and CoCl2 to corroborate their changes in placental tissues. Placentas were collected immediately after delivery from 3 groups: (1) pregnancies without PE or FGR (n=16), (2) pregnancies with PE or FGR without MgSO4 administration during pregnancy (n=14), and (3) pregnancies with PE or FGR with MgSO4 administration during pregnancy (n=28). Group 2 comprised women who were not administered MgSO4, and group 3 comprised women who did have MgSO4 exposure during pregnancy for over 48 hours. PE was diagnosed in the presence of systolic blood pressure of 140 mm Hg or higher and diastolic blood pressure of 90 mm Hg or higher on 2 occasions at least 4 hours apart, occurring after 20 weeks of gestation in pregnant women with previous normotensive blood pressure and detectable proteinuria ≥300 mg/24 hours. FGR was defined as an estimated fetal weight blow the 10th percentile according to local standards20 irrespective of Doppler abnormalities. Since all cases in group 3 were delivered before 36 weeks, we presented 36 weeks of gestation as a criterion for division of our study group for considering gestational age in analyzing PMCA and SERCA-2 expression. After collection of samples from the central mid-portion between the basal plate and chorionic membrane, the placental tissue was snap-frozen in liquid nitrogen and stored at −80°C as described by Oh et al.21 Frozen placental tissues were minced in a mortar, washed with 1× cold phosphate buffered saline (PBS) twice, and lysed in radioimmunoprecipitation assay (RIPA) buffer (50 mmol/L Tris-Cl, 150 mmol/L NaCl, 1% Nonidet P-40, 0.5% sodium deoxycholate, and 2% sodium dodecyl sulfate (SDS), pH 7.5) containing 1 mmol/L phenylmethylsulfonyl fluoride and 1× protease inhibitor cocktail (Sigma, P8340). The expression of PMCA and SERCA-2 in the placenta was localized by immunohistochemistry. Placental tissue embedded in paraffin was cut into 5 µm thick sections, deparaffinized in xylene, and hydrated in descending grades of ethanol. Antigen was retrieved by boiling in 10 mL sodium citrated buffer (pH 6.5) containing 0.05% Tween 20 for 10 minutes. Endogenous peroxidase activity was blocked with 0.3% hydrogen peroxide in Tris-buffered saline (TBS) and TBS containing Tween 20 (TBS-T) for 30 minutes. Non-specific reactions were blocked by incubating the section in 10% FBS for 1 hour at room temperature and further incubation in avidin blocking solution (Vector) for 15 minutes. Sections were subsequently incubated with antibodies against PMCA (5F10, Thermo Scientific, MA3-914) and SERCA-2 (Thermo Scientific, MA3-919) and diluted in biotin blocking solution, which was diluted in 10 mL sodium phosphate (pH 7.8) containing 0.15 M NaCl, at 4°C overnight. After washing with TBS-T, sections were incubated with a biotinylated secondary antibody (DAKO) for 1 hour at room temperature and then incubated with horseradish peroxidase (HRP)-conjugated streptavidin diluted in 1× TBS for 30 minutes at room temperature. Stained proteins were visualized using 3,3′-diaminobenidine reaction (Vector, SK 4100), and nuclei were stained with hematoxylin (Harris, Sigma) for 30 seconds. Slides were dehydrated with ascending ethanol and xylene, mounted with Permount, and observed under a ScanScope XT microscope (Aperio). For immunoblot analysis of the cellular proteins, lysates of placental tissue and BeWo cells were processed as follows. Lysates of placental tissue and BeWo cells were washed twice with cold PBS and then lysed in RIPA buffer (50 mmol/T Tris-Cl, 150 mmol/L NaCl, 1% Nonidet P-40, 0.5% sodium deoxycholate, and 2% SDS, pH 7.5) containing 1 mmol/L phenylmethylsulfonyl fluoride. Protein concentrations for each sample were determined using the bicinchoninic acid protein assay (Thermo/23227). Proteins were separated by 8% SDS polyacrylamide gel electrophoresis under reducing conditions and then electrotransferred onto a polyvinylidene difluoride membrane (Millipore, Billerica, Massachusetts IPVH00010). Blots were blocked for 1 hour using 5% non-fat dry milk in PBS containing 0.05% Tween 20, and then the membranes were incubated with polyclonal antibodies against SERCA-2 (Abcam, ab2861) and PMCA (Thermo, MA3-914) at a dilution of 1:1000 overnight at 4°C. Immunoreactive bands were detected by incubation with goat anti-rabbit or anti-mouse HRP-conjugated IgG (diluted 1:5000; Santa Cruz Biotechnology, Santa Cruz, CA, USA) at room temperature for 1 hour. Peroxidase activity was visualized with the enhanced chemiluminescence detection system (RPN2209; Amersham Pharmacia Biotech, Little Chalfont, Buckinghamshire, UK) and captured on X-ray film. β-actin (Sigma-Aldrich) antibody was used as the loading control. Data were shown in a scatter plot with the median using GraphPad Prism software for Windows, V.7.01. The densitometry analyses of western blots were performed using the linear by linear association, Mann-Whitney U test, and Kruskal-Wallis test. We also performed post hoc analysis using the Bonferroni correction. The results were considered statistically significant when the p values were less than 0.05. The clinical characteristics of the mothers and babies are summarized in table 1. As expected, there were significant differences in the characteristics, other than maternal age. Gestational age at delivery was lowest in group 3, and the birth weight was also lowest in this group. The rate of delivery before 36 weeks of gestation was highest in group 3. All pregnant women in groups 2 and 3 underwent cesarean section. Most group 2 members had FGR while approximately half of group 3 had FGR. Representative sections are shown in figure 1. The ST showed staining for PMCA and SERCA-2 on both the BM and MVM sides. 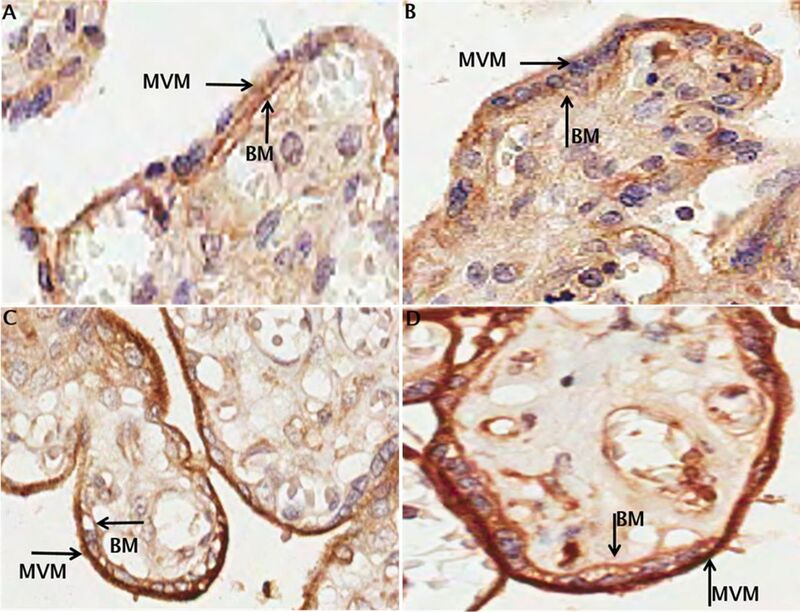 PMCA staining was more observed in the BM (figure 1A,B), whereas SERCA-2 staining was more observed under the MVM (figure 1C,D). 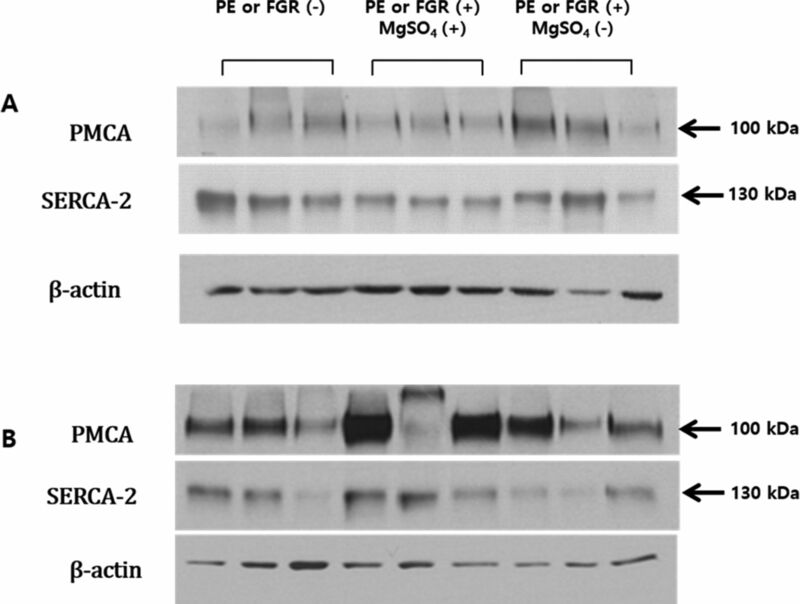 However, there was no difference in the staining of PMCA and SERCA proteins in association with PE and FGR (figure 1A vs 1B, figure 1C vs 1D). Immunohistochemical localization of plasma membrane Ca2+-ATPase (PMCA) and sarcoendoplasmic reticulum Ca2+-ATPase (SERCA) in the human placental tissue from pregnancies without pre-eclampsia (PE) or fetal growth restriction (FGR) and pregnancies with PE and FGR. (A) PMCA expression in pregnancy without PE or FGR at 26 weeks of gestation. (B) PMCA expression in pregnancy with PE and FGR under antenatal MgSO4 administration at 27 weeks of gestation. (C) SERCA-2 expression in pregnancy without PE or FGR at 28 weeks of gestation. (D) SERCA-2 expression in pregnancy with PE and FGR under antenatal MgSO4 administration at 31 weeks of gestation. PMCA staining was mostly observed in the BM whereas SERCA-2 staining was observed predominantly under the MVM. However, there was no significant difference in expression of PMCA and SERCA proteins based on PE and FGR. BM, basal membrane; MVM, microvillous membrane. Figure 2 shows representative western blots revealing PMCA and SERCA-2 expression in each group according to the gestational age at delivery. Figure 2A shows the representative western blots before 36 weeks of gestation whereas figure 2B shows the representative western blots after 36 weeks of gestation. Before 36 weeks of gestation, the expression of PMCA and SERCA-2 was similar among the 3 groups. However, after 36 weeks of gestation, PMCA expression was increased in the placentas with PE or FGR compared with those without PE or FGR. 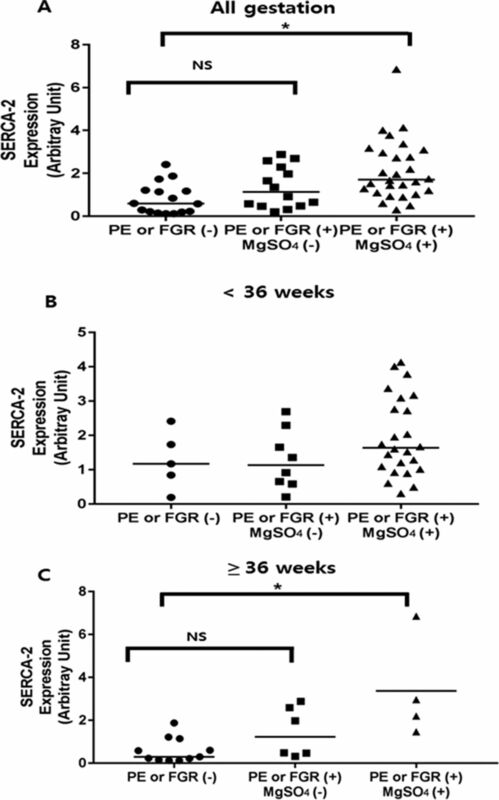 Also, SERCA-2 expression was increased in placentas with PE or FGR and antepartal MgSO4 administration. The representative western blots for PMCA and SERCA-2 in the 3 groups according to the gestational age at delivery. (A) The expression of PMCA and SERCA-2 in placentas before 36 weeks of gestation. (B) The expression of PMCA and SERCA-2 in placentas after 36 weeks of gestation. Before 36 weeks of gestation (A), the expression of PMCA and SERCA-2 was similar among the 3 groups. However, after 36 weeks of gestation (B), PMCA and SERCA-2 expression was increased in placentas with PE or FGR compared with that in placentas without PE or FGR. FGR, fetal growth restriction; PE, pre-eclampsia; PMCA, plasma membrane Ca2+-ATPase; SERCA, sarcoendoplasmic reticulum Ca2+-ATPase. No significant difference was noted in PMCA expression among the 3 groups (p=0.2772, figure 3A). In addition, no significant difference was noted in PMCA expression before 36 weeks of gestation among the 3 groups (p=0.6950, figure 3B). Interestingly, a significant difference was noted in PMCA expression after 36 weeks of gestation among the 3 groups (p<0.001, figure 3C). After 36 weeks of gestation, PMCA expression was significantly increased in groups 2 and 3 compared with that in group 1 (p=0.0009, p=0.0045, figure 3C). The PMCA expression in placentas from pregnancies with PE or FGR according to MgSO4 administration. (A) The comparison of PMCA expression among 3 gestation groups. (B) Comparison of PMCA expression among the 3 groups before 36 weeks of gestation. (C) Comparison of PMCA expression among the 3 groups after 36 weeks of gestation. PMCA expression was significantly increased in groups 2 and 3 compared with that in group 1 after 36 weeks of gestation (*p<0.05). FGR, fetal growth restriction; PE, pre-eclampsia; PMCA, plasma membrane Ca2+-ATPase. A significant difference was noted in SERCA-2 expression among the 3 groups (p=0.0008, figure 4A). Post hoc analysis revealed a difference in SERCA-2 expression between groups 1 and 3 (p=0.0006, figure 4A) but not between groups 1 and 2 (p=0.2154, figure 4A). However, before 36 weeks of gestation, no significant difference was noted in the SERCA-2 expression among the 3 groups (p=0.2163, figure 4B). After 36 weeks of gestation, SERCA-2 was increased in group 3 compared with that in group 1 (p=0.0087, figure 4C) but not increased in group 2 compared with that in group 1 (p=0.2256, figure 4C). The SERCA-2 expression in placentas from pregnancies with PE or FGR according to MgSO4 administration. (A) The comparison of SERCA-2 expression among the 3 gestation groups. (B) Comparison of SERCA-2 expression among the 3 groups before 36 weeks of gestation. (C) Comparison of SERCA-2 expression among the 3 groups after 36 weeks of gestation. There was a significant difference in SERCA-2 expression between group 1 and group 3 (*p<0.05). Also, SERCA-2 expression was significantly increased in group 3 compared with that in group 1 after 36 weeks of gestation (*p<0.05). FGR, fetal growth restriction; NS, not significant; PE, pre-eclampsia; SERCA, sarcoendoplasmic reticulum Ca2+-ATPase. As shown in figure 5A, the expression of PMCA and SERCA-2 proteins increased with increasing MgSO4 concentration (p=0.0019, p=0.006), as revealed by the linear by linear association analysis. Under hypoxia-mimicking conditions (CoCl2 treatment), SERCA-2 expression was decreased (p=0.05); however, PMCA expression increased but not to a significant level (p=0.513), as shown in figure 5B. In addition, the MgSO4 treatment together with CoCl2 could not induce significant changes in SERCA-2 expression compared with those induced by MgSO4 alone. The changes in PMCA and SERCA-2 expression resulting from the treatment of BeWo cells with MgSO4 and CoCl2 for 48 hours. 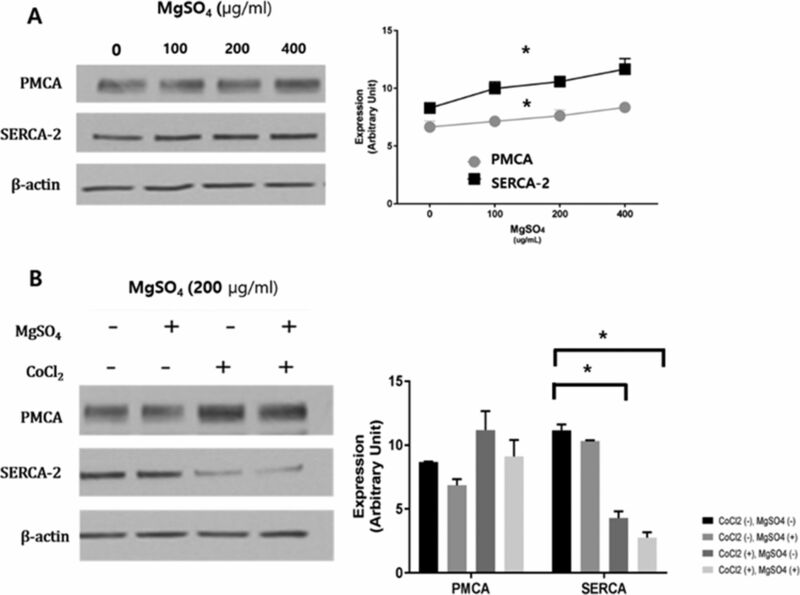 (A) Expression of both PMCA and SERCA-2 increased with increasing MgSO4 concentration (*p<0.05). (B) The expression of PMCA and SERCA-2 after the treatment with MgSO4 and CoCl2. SERCA-2 expression was decreased following CoCl2 treatment (*p=0.05). PMCA, plasma membrane Ca2+-ATPase; SERCA, sarcoendoplasmic reticulum Ca2+-ATPase. In this study, we observed the localization of PMCA and SERCA-2 in human placental tissue. We also observed that PMCA expression was increased in pregnancies with PE or FGR regardless of antepartal MgSO4 administration after 36 weeks of gestation, while SERCA-2 expression was different according to antepartal MgSO4 treatment, especially at later gestation. In addition, we observed that MgSO4 treatment increased the expression of PMCA and SERCA-2 in BeWo cells, but it decreased SERCA-2 expression under CoCl2 treatment in vitro. The higher calcium concentrations in fetal circulation than in maternal circulation have suggested an active calcium extrusion mechanism in the BM of the placenta.2 23 It has also been known that the BM possesses a high-affinity Ca2+ transport system for migration of calcium from the mother to the fetus against the calcium gradient.1 2 Previous studies have referred to this PMCA localization while discussing their results concerning the pathophysiology of PE.1 2 24 They suggested that PMCA located in the BM plays a role in active calcium extrusion to fetal circulation. In contrast, several studies suggested PMCA localization in both the MVM and BM, with higher expression in the maternal-facing MVM.4 8 Marín et al proposed that calcium diffusion to the cytoplasm of ST from maternal circulation happens through several calcium channels on the MVM and that this diffusion is rectified by the activity of PMCA.4 Abad et al reported that PMCA is expressed in both MVM and BM with higher expression in the maternal-facing MVM in the placenta, and its expression is not different between PE and normal control groups.8 We also observed that PMCA was located in both the MVM and BM; however, its expression was more predominant in the fetal-facing BM compared with the maternal-facing MVM. In addition, we observed that PE and FGR complications with antenatal MgSO4 administration did not change PMCA staining in immunohistochemical analysis. Meanwhile, the localization of SERCA-2 has not been studied extensively in regard to the pathophysiology of PE.11–13 Among the 3 isoforms of SERCA, SERCA-1 is expressed in fast-twitch skeletal muscle, SERCA-2 is expressed in all tissues, and SERCA-3 is expressed in only a limited set of tissues.13 Haché et al observed mRNA expression of all SERCA in the human placenta5; however, they did not show the localization of SERCA in the human placenta. Since ER is located in cytoplasm, we expected that SERCA-2 would be diffusely stained in the cytoplasm; however, it was expressed along ST membranes, especially under the maternal-facing MVM. Burton and Yung presented electron microscopic results reporting that ER cisternae within the ST with early onset PE were dilated compared with those without PE.14 Their figure showed that numerous ERs were located beneath the ST membranes.14 We confirmed that SERCA-2 was colocalized with reticulin (ER marker) (data are not shown). It means that ER in ST was possibly localized close to the MVM. This polarization of SERCA-2 would imply the possibility that SERCA-2 might be involved in the calcium transfer between the mother and fetus in addition to regulation of the cytosolic Ca2+ level. Further studies about SERCA localization are warranted. PMCA alteration in placentas with PE has been reported in several studies. These studies proposed that a decrease in PMCA expression or activity could contribute to the pathophysiology of PE.5 8 Haché et al showed that PMCA expression was decreased in PE both at the mRNA and protein levels.5 However, Abad et al showed that PMCA activity was decreased in the PE placenta without a change in PMCA expression.8 Several studies also showed a decrease in PMCA activity without evaluating PMCA expression in PE or PE-mimicking conditions.9 22 We evaluated the expression of PMCA and SERCA-2, but did not evaluate the activity of PMCA or SERCA-2. Unlike previous results showing the decrease s of PMCA expression or activity in PE,5 8 9 22 we observed the PMCA expression was increased in PE cases after 36 weeks of gestation. Considering that calcium transfer between a mother and the fetus occurs mainly in the latter stages of pregnancy, the expression of calcium channels may be influenced by gestational age at delivery.25 However, studies regarding PMCA or SERCA mainly included placentas from term pregnancies.4 5 7 Notably, Yang et al reported that PMCA expression was increased at the mRNA and protein levels in both preterm and term placentas with PE compared with that in normal controls.10 We could observe a difference in PMCA expression among the 3 groups only after 36 weeks of gestation (figure 3C). Strid and Powell showed that there was no significant relationship between PMCA expression and gestational age from 32 weeks of gestation until term25 and also showed an increase in PMCA activity with advancing gestational age. However, PMCA gene expression and calcium transport were increased during the last days of gestation in the rat placenta.26 We assumed that the significant difference in PMCA expression was observed beyond 36 weeks of gestation because pregnancies with PE or FGR could continue beyond 36 weeks of gestation only if the compensatory increases of PMCA occurred. That is, this increase was not observed in cases that were terminated before 36 weeks of gestation. There was the limitation that only 4 cases were continued beyond 36 weeks of gestation in group 3. To support our hypothesis, further studies on PMCA expression according to the gestational age are warranted. Our study revealed a difference in SERCA-2 expression among the 3 groups, and the difference was noted between groups 1 and 3 (figure 5A). As shown in table 1, group 3 included severe PE cases that required antenatal MgSO4 administration, indicating that the SERCA-2 change may be associated with PE rather than FGR. We could not elucidate whether disease severity increased as a result of SERCA-2 expression or antenatal MgSO4 administration. Meanwhile, this difference in SERCA-2 expression was observed for the whole study group, unlike PMCA. This indicates that SERCA-2, unlike PMCA, is expressed constantly during pregnancy and plays a primary role in maintaining ST homeostasis, rather than calcium transfer for fetal mineralization during the later stage of pregnancy. In addition, considering our immunohistochemistry results, predominant staining of SERCA-2 under the MVM indicates that SERCA-2 is involved in regulating Ca2+ levels in the ST cytoplasm. A previous study showed an increase in SERCA-2 at the mRNA level in pre-eclamptic placentas compared with the control.5 In this study, the authors suggested that hypoxia in the PE placenta induced a lack of ATPase activity, which decreased PMCA expression, and the decreased PMCA expression may evoke intracellular Ca2+ overload. For overcoming intracellular Ca2+ overload, SERCA-2 is increased in the PE placenta compared with that in the control. Further studies are warranted to elucidate the role of SERCA-2 in the pathophysiology of PE and the effect of MgSO4 on SERCA-2 in the placenta. We observed that MgSO4 treatment increased expression of both PMCA and SERCA-2 in BeWo cells. Chiarello et al insisted that MgSO4 treatment in normal placental explants stabilized the Ca2+ concentration with an increase in Mg2+ concentration, and its treatment under hypoxic conditions decreased lipid peroxidation levels with an increase in PMCA activity eventually protecting the ST.22 In our study, however, MgSO4 treatment under CoCl2 treatment could not significantly increase PMCA expression, and it even decreased SECA-2 expression in BeWo cells. It is difficult to completely reproduce the pathophysiology of PE in vitro, and it is possible that there is another mechanism in addition to hypoxia that invokes a change in the expression of PMCA or SERCA-2 in the placenta. One advantage of our study is that we enrolled cases with various gestational ages at delivery and considered antenatal MgSO4 administration not simply in the state of PE, like in previous studies.5 22 27 Also, we evaluated the SERCA expression in the human placenta, which has not been evaluated frequently in PE. However, we could not identify the exact mechanism of the changes in PMCA and SERCA-2 expression. Further studies regarding calcium channels in human placentas are warranted to elucidate the pathophysiology. In conclusion, we observed that antepartal MgSO4 treatment has a greater association with changes in SERCA-2 expression than PMCA. Further studies are needed to elucidate the role of antepartal MgSO4 treatment in the pathophysiology of PE or FGR. Contributors HHC and CRR were responsible for the study concept and design, analysis and interpretation of data, drafting of the manuscript and critical revision of the manuscript for important intellectual content. JRH and JHS were responsible for the acquisition of data. SyO and SJC were involved in the analysis and interpretation of data and statistical analyses. CRR supervised the activities. Funding This research was supported by Kyungpook National University research fund, 2013. Ethics approval The Institutional Review Board (IRB) for clinical research at Kyungpook National University Hospital in Daegu, Korea, approved the research protocol before beginning this research (IRB No: KNUMC 2016-10-022-001). Data sharing statement The authors can provide additional unpublished data from the study by email request (chh9861@knu.ac.kr or crroh@skku.edu). Presented at This manuscript was presented as an abstract form at 64th Annual Meeting of the Society for Reproductive Investigation, 15–18 March 2017 in Orlando, FL.